RSPile 2018 introduces a series of new features to make the program more versatile while improving the user’s experience. Key among these features is the ability to design pile groups and subject them to a range of loading scenarios. Computing the results of any model is done using full 3D finite element analysis techniques which provide accurate and reliable results. RSPile 2018 introduces the Cap Designer which acts as the central window for designing and editing pile groups within the software. 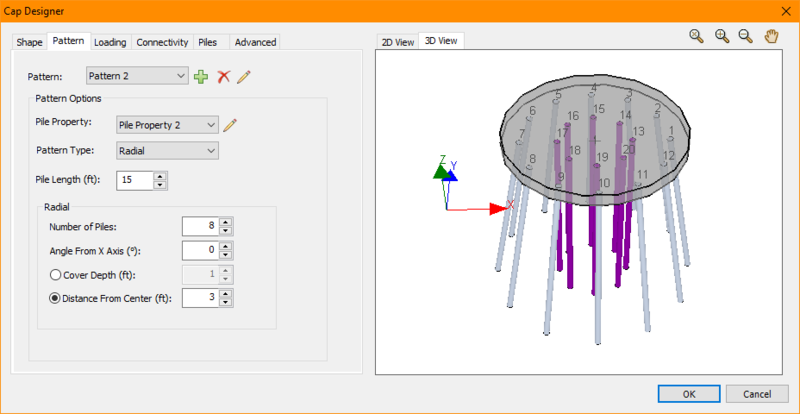 In this window the user can edit all aspects of a pile group including the cap shape, pile pattern and connections, loading and soil multipliers. The window also provides 2-dimensional and 3-dimenisonal views of the pile group that update automatically to reflect changes as they are made (see Figure 1). One of the key aspects of the Cap Designer is the ability to design simple rectangular and circular caps as well as more complex custom designs. The custom option uses a set of points which indicate each vertex of a shape to accommodate the design of any polygon (See Figure 1). The ability to utilize a series of pre-defined or custom pile patterns increases the versatility of the group pile feature further. Pre-defined options include radial or rectangular variations which allow the user to define the number of piles, spacing, and cover depth to create pile patterns. The feature is also capable of modeling multiple patterns and pile types in each cap design (see Figure 2). The custom pattern option allows the user to define each point where a pile is located allowing for variations in density, pattern and pile type based on the location within the cap (See Figure 3). The group features of RSPile pair well with the new reinforced concrete capabilities of the software. The Concrete Designer is accessible from within the Cap Designer and allows the user to design custom reinforced concrete piles. Available reinforcement options include casings, cores, rebar and I-beams available in American and Canadian Steel Standard size presets. 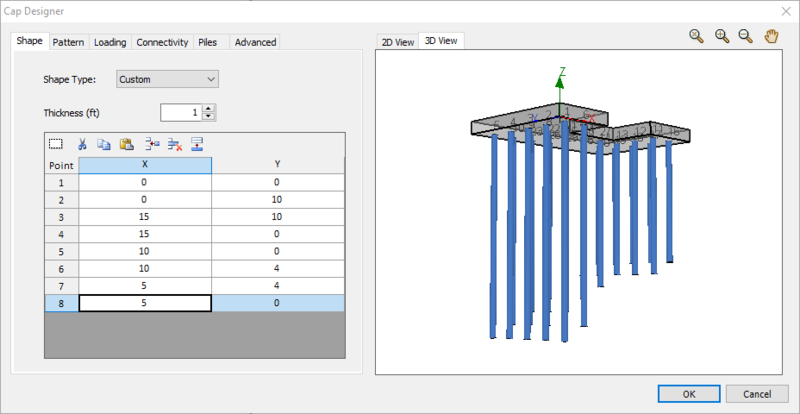 As with the Cap Designer, the custom options within the Concrete Designer allow the user to specify multiple patterns and the exact location of each reinforcement within the pile (See Figure 4). RSPile 2018 introduces the ability to apply multiple varying loads to a pile cap. This new feature makes it possible to define several combinations of axial, lateral and overturning moment loads that can be applied at any location on the pile cap. During the analysis, these loads are distributed appropriately to all the piles to compute the response of each individual pile to the scenario. For connections between each pile and the pile cap, the connectivity options allow the user to define a pinned, fixed, or restrained connection to create more accurate models. The ability to manipulate individual piles in a group is another key feature of the Cap Designer dialogue. RSPile 2018 can alter the elevation and length of each individual pile to create more accurate models. 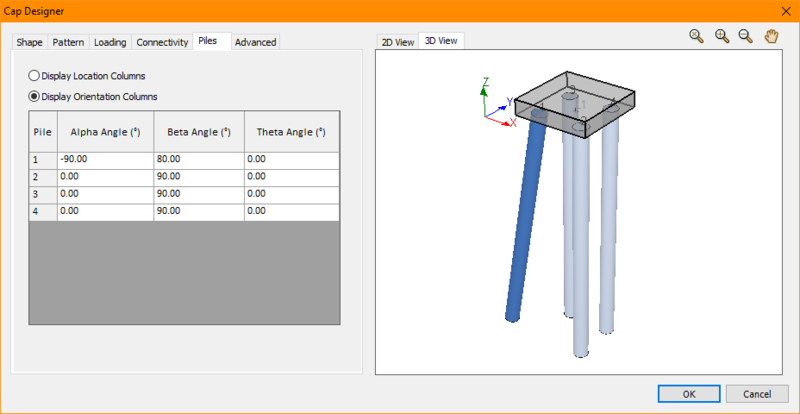 The software can also orient each pile independently of the rest allowing the user to define piles in any orientation (See Figure 5). For each pile group pattern, it may be desirable to use p-y, t-z or q-z multipliers to better reflect the soil conditions. 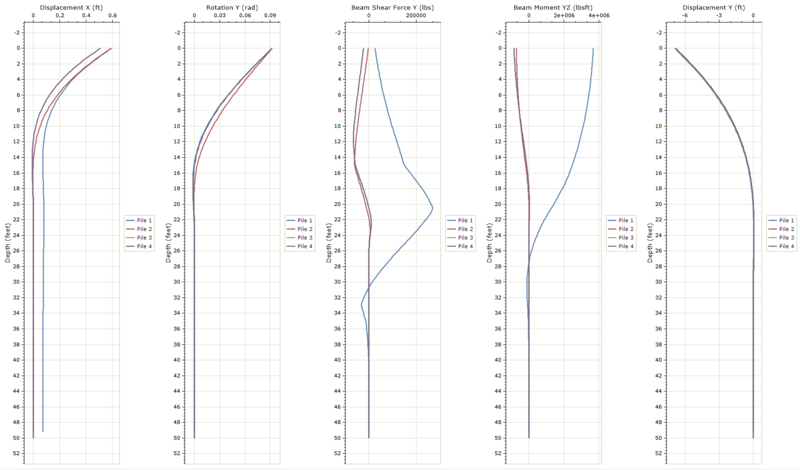 RSPile 2018 allows for these load transfer curves to be modified to better represent the soil skin friction or end bearing resistance of any soil profile that might need to be modeled.